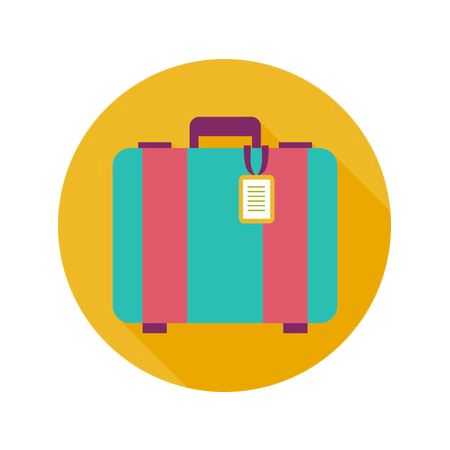 If your registered luggage is lost, damaged or delayed, you may be entitled to compensation from the airline up to about €1,200. Among all the passenger mishaps that can happen problems with checked luggage is the most common. In fact, it may happen that at arrival to the destination, the passenger finds out that his/her luggage has been lost or damaged, in which case the passenger must file a report of lost or damaged luggage (called P.I.R. - Property Irregularity Report) at a dedicated Lost and Found Office before leaving the baggage claim area. Depending on the type of problem, a specific procedure will be followed to start the process of refunding the passenger for damages against the airline. Delayed delivery is when the luggage is found no later than 21 days from the filing of the P.I.R. In this case, it is possible to request, within the 21 day period from the date it was suppose to arrive, reimbursement of any expenses incurred to purchase the necessary personal items in the absence of luggage in addition to compensation for the late delivery (it is important to keep documentation of the expenses: receipts, etc.). Lost is when the luggage is not found within 21 days of filing the P.I.R. In this, case it is possible to request, within the 21 day period from when the carrier admits the loss of luggage, in addition to compensation for the loss, reimbursement of any expenses incurred to purchase the necessary personal items in the absence of luggage in addition to compensation (it is important to keep documentation of the expenses: receipts, etc.). However, in any case, it is suggested to send the claim before the 21 day expiration from the date on which the baggage should have been returned. In case of damage, within 7 days from the date of delivery of the luggage and the P.I.R., you can claim compensation for damages incurred during air transport and in particular during the boarding procedures and return. The claims, in the event of problems, related to the delivery of luggage is regulated by the 1999 Montreal Convention and the Regulation 889/2002 / EC, which transposes into a community context as defined internationally. For problems described on the carrier's liability, article 17 of the Montreal Convention states "The carrier liable for damage sustained in case of destruction or loss of, or of damage to, checked baggage upon condition only that the event which caused the destruction, loss or damage took place on board the aircraft or during any period within which the checked baggage was in the charge of the carrier." The limits of liability for the carrier itself is governed by article 22 of the Montreal Convention, which states that each passenger has the right to compensation of up to 1,000 SDRs (Special Drawing Rights) or approximately €1,200.00 and up to 17 DSP (about 19 euro) per kg of luggage in case the airlines adheres to the Warsaw Convention. If you, under this Regulation, have suffered injury greater than compensated by the airline, you will also need to act further for such damage and provide a special declaration of interest in delivery at the check-in, upon payment of an additional tax. In that case the carrier will be liable to pay the amount declared.